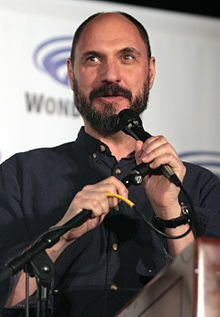 Loren Hal Bouchard (born October 10, 1969) is an American animator, writer, producer, television director, and composer. He is best known for being the creator of several animated TV shows such as Bob's Burgers and Lucy, the Daughter of the Devil. He is also the co-creator of Home Movies with Brendon Small. Bouchard was born in New York City to a Jewish mother and Catholic father. He grew up in Medford, Massachusetts. A high school dropout, Bouchard was working as a bartender in 1993 when he bumped into a former grade school teacher of his, Tom Snyder, who asked if Bouchard was still drawing, and offered Bouchard a chance to work on a few animated short films Snyder was making. The shorts developed into Bouchard's first series, Dr. Katz, Professional Therapist, which he produced. He credits Jonathan Katz, H. Jon Benjamin, and Snyder as major influences. Dr. Katz ran for six seasons, from 1995 to 2000. He also produced one season of Science Court, another animated show made by Soup2Nuts. Towards the end of Dr. Katz, Bouchard and Brendon Small teamed up to create Home Movies. The show was picked up initially by UPN, which dropped it after five episodes; the remaining eight episodes from season one, and the subsequent three seasons, were shown on Adult Swim. The show was not renewed after the conclusion of the fourth season in 2004. After Home Movies concluded and another Bouchard pilot, Saddle Rash, was not picked up, Bouchard created Lucy, the Daughter of the Devil. The show's pilot was created on October 30, 2005, but it was not until September 2007 that the show debuted as a weekly feature on Adult Swim. He was a consulting producer on HBO's The Ricky Gervais Show. In 2009, Bouchard got together with King of the Hill writer and producer Jim Dauterive and developed Bob's Burgers, an animated series about a family working at a hamburger restaurant. Bouchard grew up in a working-class family full of "blue collar creatives" and created Bob's Burgers because he didn't see that kind of life represented on TV. In 2010, Fox placed the series on the primetime slate for the 2010–11 television season. A special preview aired on Thanksgiving on November 25, 2010. When the series premiered, it received mixed reviews with a Metacritic score of 54 out of 100. However, as the first season progressed and concluded and the second began, critics began giving the series praise. The show has generally been viewed as a spiritual successor to King of the Hill, which carried less emphasis on shock comedy and focused more on character-driven humor. A film adaptation based on the animated TV series is in the works and is scheduled for a July 17, 2020 release. Bouchard lives in Los Angeles with his wife, Holly Kretschmar. The couple married on September 3, 2006. ^ Schneider, Michael (November 30, 2009). "Fox cooking up 'Bob's Burgers'". Variety. Retrieved June 30, 2010. ^ "Well Done Television - Long Island Weekly". longislandweekly.com. Retrieved 2016-09-21. ^ "Breaking News – FOX Announces Primetime Slate for 2010–2011 Season". TheFutonCritic.com. Retrieved May 5, 2012. ^ "Breaking News – Special 'Bob's Burgers' Sampler Added to FOX's Thanksgiving Menu Thursday, November 25". TheFutonCritic.com. Retrieved May 5, 2012. ^ "Bob's Burgers – Season 1 Reviews". Metacritic. January 9, 2011. Retrieved June 5, 2013. ^ Ayers, Michael (December 1, 2009). "Fox Orders 13 Episodes of 'Bob's Burgers'". TV Squad. Retrieved June 30, 2010. ^ Hipes, Patrick (October 4, 2017). "'Bob's Burgers' Movie Ordered Up For 2020". Deadline. Retrieved October 4, 2017. ^ "Shandling, HBO Top Cable Awards : Television: The star and his 'Larry Sanders Show' each get four CableACE honors. HBO wins 27 of the 81 prizes". LA Times. Retrieved 6 September 2015. ^ "2012 Teen Choice Awards, Nominees, Winners, TV Schedule". Chiff.com. July 22, 2012. ^ "Critics' Choice Awards | Broadcast Television Journalists Association Announces Winners of the 2nd Annual Critics' Choice Television Awards". Criticschoice.com. June 18, 2012. ^ "First Wave of 'Teen Choice 2012′ Nominees Announced; Special Airs Sunday July 22 on FOX". TV by the Numbers. zap2it.com. ^ Tapley, Kristopher (December 3, 2012). "'Brave,' 'Guardians' and 'Wreck-It Ralph' lead 40th annual Annie Awards nominees". Hitfix. Retrieved January 31, 2014. ^ Trudon, Taylor (May 22, 2013). "Teen Choice Awards Nominees Announced!". Huffington Post. ^ "41st Annual Awards Rules and Categories". annieawards.org. Archived from the original on 16 January 2014. Retrieved 16 January 2014. ^ "Outstanding Animated Program 2014" (PDF). Emmys.com. Academy of Television Arts & Sciences. Retrieved 2014-07-11. ^ "'Boxtrolls' Leads Annie Award Nominations With 13". Retrieved December 4, 2014. ^ "Critics' Choice TV Awards 2014: And the nominees are..." Time. May 6, 2015. Retrieved May 8, 2015. ^ "John Oliver, 'Mad Max: Fury Road' Nominated for Environmental Media Awards". TheWrap. Retrieved 9 August 2014. ^ "Nominations for the 68th Primetime Emmy Awards". Los Angeles Times. 14 July 2016. Retrieved July 15, 2016. ^ "PEOPLE'S CHOICE AWARDS 2017: FULL LIST OF NOMINEES". People's Choice website. November 15, 2016. Retrieved November 15, 2016. ^ Tapley, Kristopher. "Netflix, FX's 'Feud' Lead Critics' Choice TV Nominations". Variety. Retrieved 6 December 2017. ^ "Nominees/Winners | 70th Annual Primetime Emmy Award Nominations". emmys.com. Retrieved July 17, 2018.